It may have been quite a long time coming but this eleventh disc from The Cardinall's Musick in their monumental exploration of William Byrd has certainly been worth the wait. The programme is built from the Cantiones Sacrae of 1591 and the Gradualia of 1607 and focuses on Byrd's recusant music. Throughout their series of recordings this method of interspersing the three books of Cantiones Sacrae with the two of Graduallia has been highly successful and what is most exciting is that it allows Andrew Carwood to be the first director to record the entire music from the Gradualia in liturgically appropriate combinations. Opening this album is the exquisite six-voice setting of Descendit de caelis which immediately confirms that these are performances that are every bit as good as the previous award-winning volume. There can be very few singers in the world just now that have such an understanding of Byrd's vocal works as The Cardinall's Musick and here they give impassioned and immediate performances that move on from the early music stereotypes that used to dominate in this field. But however passionately they are sung, these later Cantiones Sacrae motets are not easy listening. Carwood never flinches from the glimpses of despair that Byrd and his Catholic friends would have felt as they clung on to their faith in troubled times, nor is he tempted to over-represent the more hopeful moments in an attempt to sugar-coat the situation either. This is deeply emotional music and it is astonishing to think that Byrd could have published it in such times. There is a different atmosphere to the movements from the 1607 Gradualia however. These were written after Byrd had relocated from London to the relative tranquility of Essex; but even in Stondon Massey, the Byrd family were not quite beyond the reach of the law and many of these pieces were performed in secret at Ingatestone Hall. I wonder if the intimacy of these original performances is reflected here by the one-voice-per-part approach with Rebecca Outram and Caroline Trevor complementing each other so beautifully on the on the upper lines? Indeed it is pleasing to hear women's voices in this music rather than high countertenors as it conjures up images of the Gradualia as chamber music, performed in the home of recusants who would have avoided the more obvious settings of private chapels to celebrate mass. Certainly Hodie Simon Petrus has madrigalian traits, the jangling of the keys of heaven, and in Solve, iubente Deo there is similarly quick and intricate music at the casting off of chains. The detail in these later works from the second book of Gradualia never ceases to amaze and it is wonderful to have it all so brilliantly realized by The Cardinall's Musick. Despite the outstanding performances it is ultimately William Byrd himself who is the star of this disc; with eleven volumes of Latin church music recorded so far there is still no hint of his inspiration drying up. It takes a very exceptional talent to find so many varied and interesting ways to set the word 'Alleluia' as he does in the Gradualia and an equally special ensemble to sing each one in such a fresh way. 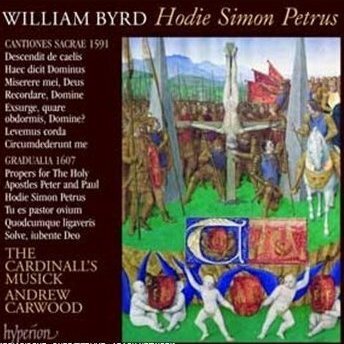 This bigger, bolder style of singing polyphony that The Cardinall's Musick have pioneered seems, to my modern ears, very suitable for Byrd's impassioned music but whether or not it stands a longer test of time remains to be seen. Fashions in singing are fickle and on these grounds one can understand why many conductors seem to prefer a less interpreted 'urtext' approach to their recorded work. I often think that The Cardinall's Musick is what happens when The Tallis Scholars let their hair down, and in this music – at least – it seems that they are taking us on an exhilarating voyage of discovery, the importance of which cannot be overestimated.